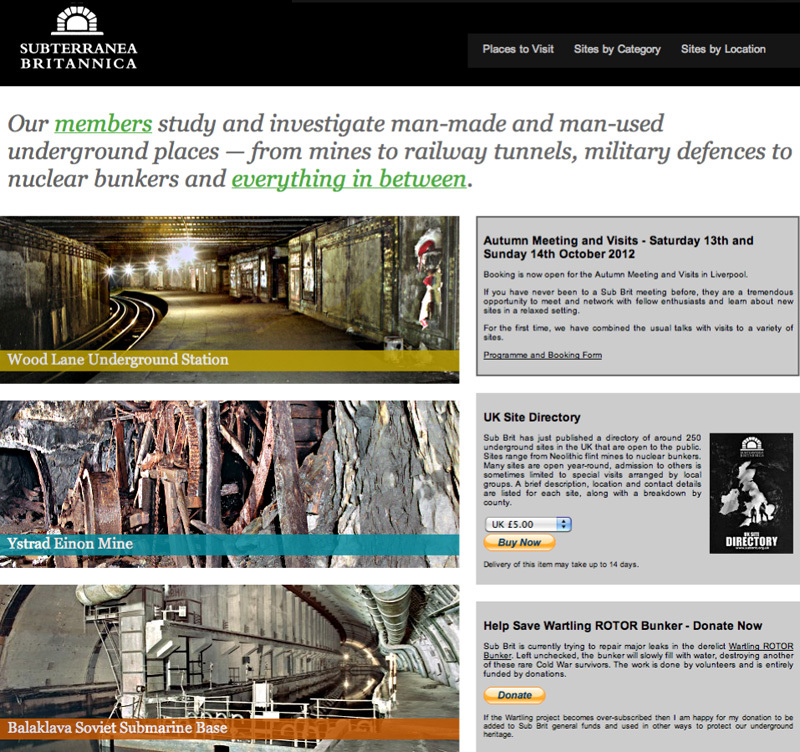 I finally became a paying member of Subterranea Britannica this week, a website and historical organization whose interests (and influence) cast a long shadow over this blog's early years. Joining is £28 a year for overseas members and seems well worth it so far, having received my first issue of their internal newsletter, Subterranea, just last night. From Irish souterrains—described as "the 'underground castles' of early medieval Ireland, used as strongholds and escape tunnels," or, in the words of Current Archaeology, "secret tunnels dug to outwit marauding Norsemen"—to World War I tunnels in La Boisselle, France, and from plans for future deep-level "supersewers" beneath both Milwaukee and London to, amongst many other fascinating things, a project I can't wait to learn more about called the London Power Tunnels, a mafia boss who was captured in an "underground hideout" built twelve miles outside Naples ("access from within the house was via a sliding door on rails in one of the bedrooms," Subterranea explains), the fact that Northern Ireland had "secret contingency plans" for surviving a nuclear war and they involved stockpiling "more than 100,000 pieces of plastic cutlery," to the enormous "stacks of gold bars worth £156 billion stored in an old canteen deep below the streets" of London in a former WWII air-raid shelter now used by the Bank of England, there is a mind-boggling amount of interesting things to read. Even better, membership comes with otherwise unobtainable invitations to events and underground site tours throughout the UK. Consider joining, if this sort of stuff piques your interest.